For the article about the Religious order, see Order of the Most Holy Annunciation. The collar badge of the Order, which depicts Our Lady of the Annunciation, is worn on the feast day of the Most Holy Annunciation. The origins of the Supreme Order of the Most Holy Annunciation begins in 1362, when Amadeus VI, Count of Savoy (1343-1383) instituted the order's earliest designation, under the title of Order of the Collar. Even at this time, the order was dedicated to the Blessed Virgin Mary, who is celebrated as "Our Lady of the Annunciation." Thus, the order is a dynastic religious (or Catholic) order of chivalry. The Annunciation to the Virgin Mary is depicted on the plaque surrounded by the motto F.E.R.T., and is worn on the left breast of a knight of the Order. Under its first formulation, the order had fifteen knights. The number was symbolic of the number of daily masses celebrated with the order. In 1409, Amadeus VIII, Duke of Savoy, gave the order its first known statutes, and in 1434, he extended the order to five more knights. 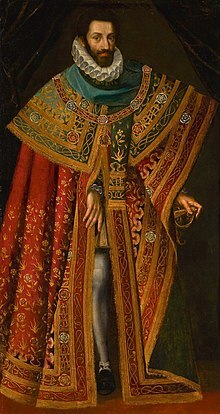 Amadeus VIII's statutes were subsequently amended and reformed by Charles III, Duke of Savoy in 1518, by Emanuele Filiberto, Duke of Savoy in 1570, and thereafter by succeeding Sovereigns. The most recent took place on 11 June 1985 by HRH Victor Emmanuel, Prince of Naples and hereditary Grand Master of the order. It was in 1518, that many of the present designations were instituted. Most importantly, the order's name was changed to its current name, The Most Holy Order of the Annunciation. The badge of the order was also changed, with the representation of the Blessed Virgin Mary being added. The order, throughout its early history and following the reforms of Charles III, was awarded for supreme recognition of distinguished services. The order constituted a kind of religious and military fraternity between the Sovereign Head of the Order and his companions; it was reserved exclusively to distinguished men-at-arms who, apart from exemplary service, had to be of illustrious birth, particularly of catholic and noble birth. Eventually, it was deemed appropriate to recognize also those who had rendered distinguished service to the Kingdom of Italy (and now the House of Savoy) in the exercise of high civil offices, not requiring, when a such achievements could be demonstrated, nobility of birth as well. The number of knights of the Supreme Order of the most Holy Annunciation shall be, as in the past, twenty. The right to appoint knights and officers of the Order appertains exclusively to the Sovereign Head. Nevertheless, when there are vacancies, the Sovereign Head meets with the Chapter of knights to hear their advice on the proposal of candidates whom he alone may select. The knights shall be chosen from distinguished individuals in recognition of their eminent services in high military positions, as well as from those who have distinguished themselves in senior positions in the civil service, and from those who, as private citizens have brought distinction upon Italy as exemplary benefactors of the Nation or of Mankind, or have rendered particularly noteworthy services to the Royal House of Savoy. Knights must have already been awarded the Order of Saints Maurice and Lazarus. Knights must be Catholic. In rare occasions, a non-Catholic may be awarded the order. However, they may only be honorary members of the order. In 1925, a law was passed on the day before Christmas which made the Head of Government (who at the time was Benito Mussolini) the Secretary of the Order, and stipulated that he would preside over the Knights of the Order at public functions and ceremonies. The order has only one class, i.e. Knight. The full Italian title is Cavaliere dell'Ordine Supremo della Santissima Annunziata. Although the order has only one class, it has two sets of insignia, the Piccola Collana and the Grande Collana. The two hold similar designs, though the Grande Collana has some different features than the Piccola Collana and is worn only on the most special of occasions. The primary and oldest insignia of the order is its collar. It consists of a solid gold medallion of the collar, which portrays the Annunciation of the Blessed Virgin Mary by the Archangel Gabriel. The medallion is surrounded by three intertwined Savoyan knots, decorated with small crosses fleury, and in the upper center, between two of the Savoyan knots, a cluster of rays with a dove, representing the Holy Spirit, is depicted also in gold. When the order is not worn, Knights may wear a gold miniature of the badge (medallion of the collar) of the order suspended from a red ribbon. They may also wear either a ribbon-bar (upon a uniform) or a rosette (upon a suit), both of which are red and have a miniature cross of four pommels engraved with the Annunciation. The Grand Magisterium is the governing body of the dynastic orders of the Royal House of Savoy. It consists of the Sovereign and Grand Master of the Order, the Grand Chancellor of the Order, the Council of the Order, Members, and the Giunta of the Order. The following are some of those that make up the Grand Magisterium of the order. Wikimedia Commons has media related to Order of the Most Holy Annunciation. ^ a b c Syr Gawayn and the Grene Knyzt-(Concluded), J. R. Hulbert, Modern Philology, Vol. 13, No. 12 (Apr., 1916), 140. ^ "Ordini Dinastici della Real Casa Savoia". disavoia.org (in Italian). Archived from the original on 2006-06-14. Retrieved 2017-04-18. ^ Miller 2015, p. 570.